In 1927, Richard de la Mare had an idea for some Christmas cards. Because he was a production director at London’s Faber & Gwyer, his cards were festive poetry pamphlets that could be sent to clients and sold to customers for one shilling a piece. Because two years earlier Geoffrey Faber had lured a banker from Lloyd’s Bank to work as an editor at his publishing house, Faber & Gwyer had T. S. Eliot to contribute to the series. Named for Shakespeare’s sprite, the Ariel poems each addressed the Christmas holiday or a seasonal theme. G. K. Chesterton, Thomas Hardy, D. H. Lawrence, Siegfried Sassoon, Vita Sackville-West, Edith Sitwell, and W. B. Yeats all contributed. The Ariel series followed a strict formula: identical cardboard bindings; title, illustrator, author, and occasionally an illustration on the cover; and two interior sheets folded to make four pages. The first page repeated the title information; the following three featured the poem and an original illustration. 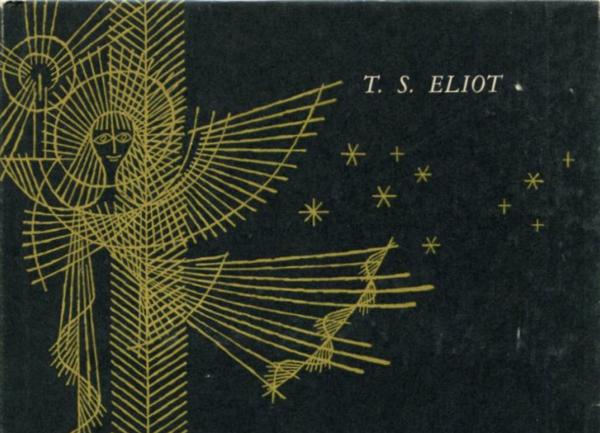 T. S. Eliot wrote six poems for the series: “The Journey of the Magi” (1927), “A Song for Simeon” (1928), “Animula” (1929), “Marina” (1930), “Triumphal March” (1931), and, later when the series was revived, “The Cultivation of Christmas Trees” (1954). Only thirty-four lines long, that final poem is like a whisper in the whirlwind of dramatic plays and long poems that characterize most of Eliot’s later work. “The Cultivation of Christmas Trees” came decades after “The Love Song of J. Alfred Prufrock” (1917) and The Waste Land (1922), years after Old Possum’s Book of Practical Cats (1939) and The Four Quartets (1943). I think of Eliot’s Christmas trees every year around this time: when firs, pines, and spruces appear in living rooms, storefronts, and town squares around the country. Eliot wrote the poem when he was sixty-six years old. His voice is wizened, yet wistful as he reaches through all the years of his life to recover “the spirit of wonder” from his earliest Christmases. Though formal and serious, the poem seems almost saccharine when compared to his earlier work. It will surprise many that the poet of fragments and ruins eventually turned his attention to the pretty packages and bright lights of Christmas. Eliot had been baptized and confirmed in the Anglican Church in 1927, a profound religious experience recorded in his earlier Ariel poems, most notably “The Journey of the Magi.” Most of his literary contemporaries did not understand his conversion or the poems that followed and his faith remains divisive for readers and scholars of his work. For many, Eliot’s work was ruined by religion; the young secularist produced better criticism and poetry. For others, even those who aspired to admire his faith, Eliot the believer became too conservative and returned to the anti-Semitism of his youth. For those who celebrate Christmas religiously or even culturally, the earliest Christmas produces an inventory like the one offered by the poem. Returning to your first Christmas recovers the verdant odor of the tree, the soft pierce of its needles, the colorful paper or popcorn chains wrapped round it like a scarf, all of the ornaments that hook by hook made the tree your own. This terrifying litany has always been the center of the poem for me. Eliot captures so many of life’s distractions and duties, which can deaden Christmas and blur all the days that fill our calendars. Experience need not be the end of innocence, yet “bored habituation,” “fatigue,” “tedium,” and “failure” often are just that. Eliot catalogues all that dulls candles so they no longer burn like stars, everything that clips the wings of angels so they no longer sing on high but sit speechless. The poem’s syntax dramatizes this tedium of experience: though four stanzas long, it is only two sentences. The first is compact like a snowball, contained entirely in the first stanza; the second falls like a long, slow snowstorm across the remaining three stanzas. While infant sight is frenetic, age inures our vision, so what the child lives in frenzied lines, the experienced adult belabors in three long stanzas. Eliot’s hope is that “accumulated memories of annual emotion / May be concentrated into a great joy,” that we might not be jaded like the final three stanzas, but joyful like the first. I return to Eliot’s poem to be reminded of that joy. At Eliot’s invitation, every December I try to remember my first December. I smell logs burning in my family’s woodstoves, their smoky scent mingling with the living odor of a tree my father felled himself, that reached eight feet high, like a redwood into the heights of our log cabin’s cathedral ceiling. I see the beautiful angel that my mother made herself: porcelain head and hands that she shaped and then fired in a friend’s kiln, all joined by a cotton-stuffed fabric body, all covered by a white satin dress. I hear the soft symphony as my sisters woke that angel, strings of bubble lights, and ornaments from their deep sleep between sheets of tissue paper in cardboard boxes. Year after year, tedium finds its way into even this holiday: “the fatigue” of appointments and meetings; “the consciousness of failure” in bills unpaid and friends neglected; “[t]he awareness of death” in my mother’s arthritis, my father’s slowing steps, and my own grey hairs. The bubble lights look less like stars; a few of them aren’t even working. The construction paper links on the paper chains are faded and loose. The stained glass I made in preschool is really only bits of cellophane pasted crudely between squares of shiny paper. My parents now have an artificial tree that doesn’t need watering. Even the angel is only a tree topper, a porcelain doll with improbable wings. I look back to Eliot’s poem where hope stretches from the first Christmas to “the eightieth Christmas,” explained in a tender parenthetical: “By ‘eightieth’ meaning whichever is last.” Eliot himself would not make it to eighty. He died in January of 1965, having celebrated only seventy-six Christmases. He continued writing criticism, delivering lectures, and even wrote another play, but “The Cultivation of Christmas Trees” was one of the last poems that he published. The poem’s closing couplet reads: “Because the beginning shall remind us of the end / And the first coming of the second coming.” Eliot invokes a distinctly Christian belief about the birth of Jesus and the return of Christ, moving deftly between Christmas, Easter, Pentecost, and the Second Coming, but he also conveys a more universal idea about the bond between life and death. The poem will hold special significance for those who share Eliot’s faith, but its appeal extends beyond those beliefs. There are always beginnings and endings, springs and winters, whether those seasons call to mind the heavenly seasons of creation and restoration or only the human seasons of birth and death. The symbolism of evergreen trees predates Christianity, and the Christmas trees of Eliot’s poem have meaning beyond their religiosity. The cultivation in the poem’s title is not really of trees, but of persons. Joy is born naturally, but it requires tending if it is to last. If our senescence is to be anything like our infancy, then it will require cultivating a sense of wonder. In appealing to first and lasts, Eliot is, as in the rest of his poetry, at the edge of despair; only in “The Cultivation of Christmas Trees,” he stands firmly on the side of joy. I love the poem because he invites us to join him, to look again for enchantment and wonder in our lives, to stare at Christmas trees until the electric lights twinkle like stars.